MOLLIE’S DELICIOUS and Pristine, two of the best early season apples, are relatively new varieties, both developed at Rutgers University in New Jersey (Rutgers has one of the few remaining apple breeding programs in the United States, part of a cooperative with Purdue University and the University of Illinois). Pristine has a lemon-yellow skin with a pink blush. A crisp, juicy apple, it has a sweet-tart flavor with hints of citrus. Pristine is unusually crisp for an early apple, and stores well compared to many early varieties. 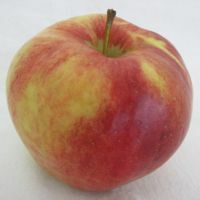 Pristine was developed from a numbered, unnamed seedling planted in 1975, crossed with Camuzat, a little-known apple from Spain. Pristine was introduced commercially in 1994. 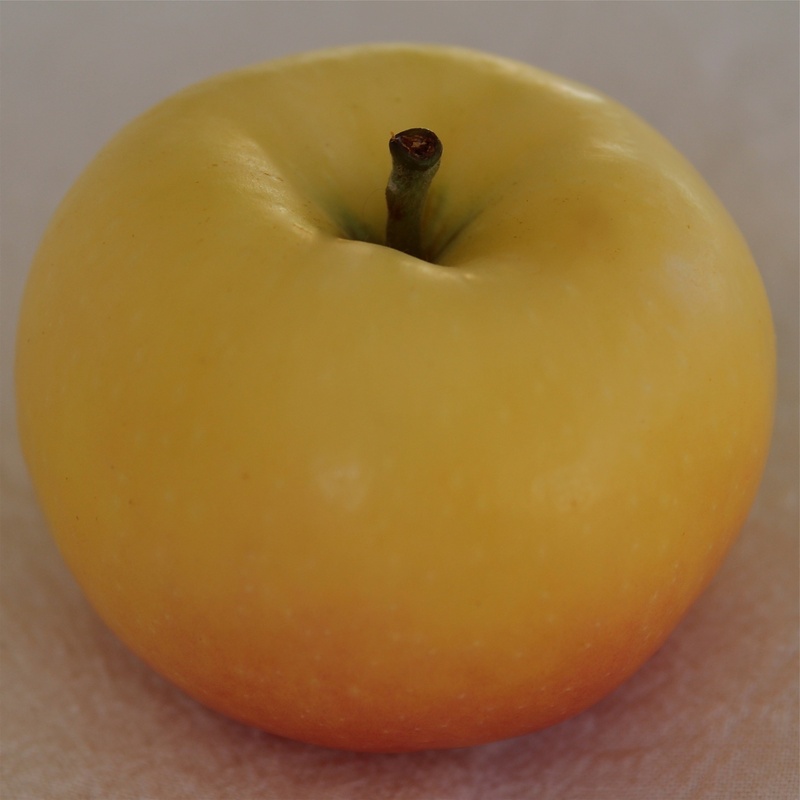 Mollie’s Delicious is a crisp, sweet, juicy apple with coarse, greenish or cream-colored flesh. It is large, ribbed, and conical in shape, with red coloring over a yellow skin. Mollies must be handled with care, as they tend to bruise easily, but they can be stored for several months. Mollie’s Delicious was developed in 1948 at the Rutgers University Agricultural Experiment Station. It is a cross of two crosses: Golden Delicious and Edgewood, and Red Gravenstein and Close. Mollie’s Delicious was introduced in 1966 and named after an admirer of the apple, Mollie Whatley. THE FOLLOWING RECIPE for Chunky Apple Bars was adapted from Healthy To The Core, a new book of “all-natural, low sugar/no sugar apple recipes for kids,” by Lee Jackson. We did not have unrefined cane sugar on hand, so substituted regular white sugar. But the quantity — just 2 tablespoons — was unusually low, and combined with the tablespoon of honey in the filling was plenty to augment the apples’ natural sweetness. The oatmeal, cinnamon, and apple flavor was good but the bars were best eaten with a fork, as they did not hold together. In fairness, we substituted half whole wheat flour, while Jackson’s recipe called for all white flour. For the recipe below, we reduced the whole wheat flour by 1/2 cup. When we make the bars again, we might also add one or two more tablespoons of oil or butter. Preheat oven to 350°. Grease 9×13 pan. To make filling, combine apples, water, honey, and cinnamon in medium saucepan. Bring to a boil. Reduce heat and simmer uncovered for about 5 minutes, until apples are slightly soft. Remove from heat. For crust, in large mixing bowl, cream butter and sugar. Add oatmeal, flour, baking powder, and cinnamon. Mix well. Reserve 2 cups for topping. Press remaining oat mixture in bottom of prepared pan, and bake for 12 minutes. Spread cooked apple filling over baked crust. Sprinkle reserved oat mixture over top. Bake 15-20 minutes, until top is nicely browned. Cool. Cut into bars. 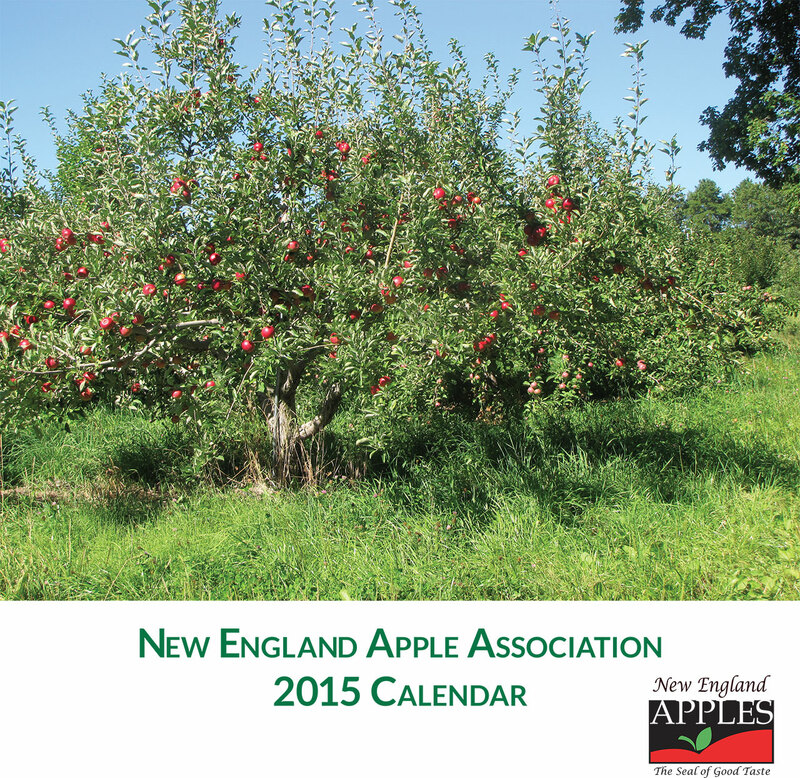 THE 2015 NEW ENGLAND APPLES wall calendar is now available for order. 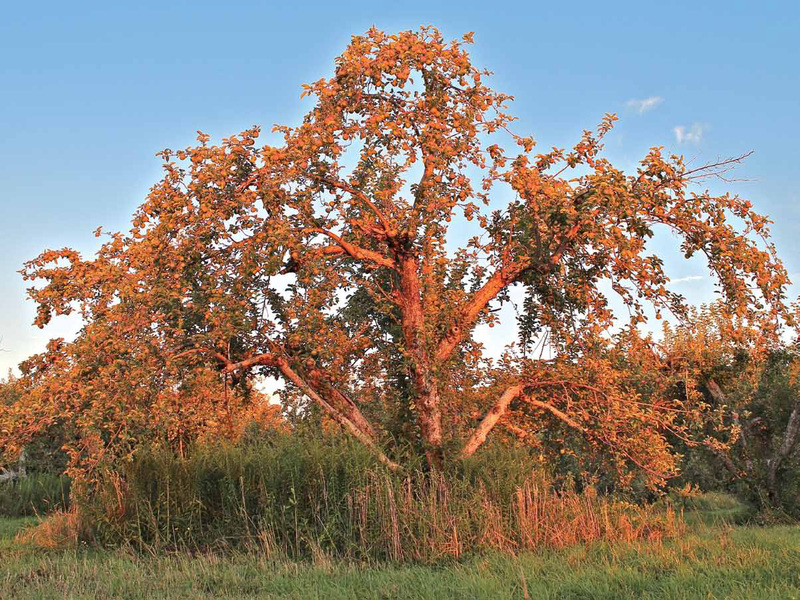 The 12”x12”, four-color calendar features photographs by Russell Steven Powell and Bar Lois Weeks from orchards throughout the six-state region, plus photos and descriptions of a dozen apple varieties. The calendar price of $12.95 includes shipping. To order, send a check to New England Apples, PO Box 41, Hatfield, MA 01038, or email info@newenglandapples.org.